For the true professional, or dedicated amateur MX or Enduro rider, SIDI will be producing the sequel to their Crossfire boots, simply named the SIDI Crossfire 2. The Crossfire 2 will come in the same two flavors as the previous version: The Crossfire 2 SRS and the Crossfire 2 TA. If you haven't learned the distinction between SRS and TA, let me briefly explain. SRS stands for "Sole Replacement System." As the name implies, these SRS models feature a removable sole (using small screws) for a quick and easy replacement. The casual rider won't see the need for this very often, however a serious off-road adventurer will know that they put a lot of wear on their boots, making for a more frequent need to replace soles. In addition to the convenience, the SRS has a smaller footprint, making it less clunky and more precise when fishing for controls. 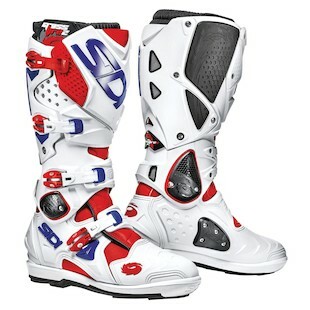 The SIDI Crossfire 2 SRS Boots come in a plethora of colors, including red/white/blue, white/orange, and black/grey/f.yellow. 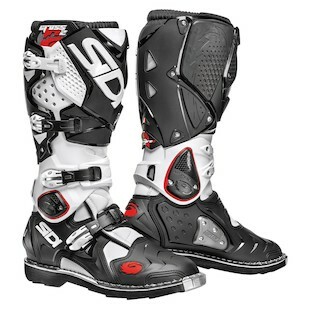 The SIDI Crossfire 2 TA Boots comes only in black, white, and white/black. Outside of the sole, both boots are identical in construction, showcasing SIDI's dual flex system. This dual position hinge gives proper mobility to the Crossfire 2 Boots while providing a rigid structure that prevents over or under extension of the ankle, as well as having anti-twist and ant-roll properties. Sparing no expense on protection, the heel is fashioned with a rigid, shock resistant heel piece that is ribbed to assist with upshifts made with the back of your foot. Stay tuned for a video review, coming shortly. The Crossfire 2 is packed with details; an exciting reinvention from SIDI.